All the Verify pages are structured in a similar fashion to each other. Verify Data page has just one addition compared to other Verify pages. Selecting either of the two options and pressing the Go Button changes the GUI. 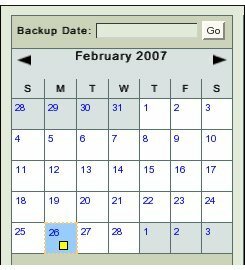 The GUI shows a Calender control to help choose a date. The current Date is shown as surrounded by a blue rectangle. In the Fig 2 above, Feb 26th is shown in such a way. Fig 3 shows 15th Feb. as having been selected. All dates that were previously selected also continue to show by their color the previous selection . In Fig 2 above the Date 26th Feb shows that on that day a single Backup has been taken and it had some warnings. Select a Date and go ahead by clicking the Verify Data Button. Go Back by clicking the Back Button. 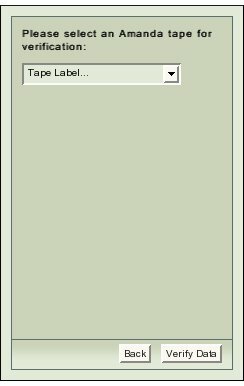 The GUI shows a Drop Down box from where users can pick a Tape label. Select a Tape Label and click the Data Verify Button to go ahead. In verify by Date,all the Tapes of Backup Set of selected date get verified. Click the hyper link 'here' to see further progress. Further progress messages/ error messages will appear in area 4 . The error messages are verbose to make it easy to determine what the error was. Here, on the Date selected, Media has been successfully verified.